It does look like an interesting character concept and it's also well drawn, good job ^.^ I was wondering, what kind of bonuses do player get by exploring? And how to get thoose bonuses (like "opening" the map, standing close to specific things)? Ok went back to work today and added sanity regeneration while close to fire adding theese lines of code Edit: the rain damage for the basic game and RoG dlc changes: should i make it for the basic game or for RoG? After 2 hours of hard work i found out... that i can't get why it crashes on startup!!! I think i am gonna try to use the old version that i gave to you and work on it. If it works for you, it's strange that it does not for me. Now the title is version 2.0 2.0 XD. Did you succeed in adding sanity while close to fire or it is still to do? Also, are there others special abilities that you want to do? Edit: the mod makes the game crash as i enable it, it happened to me too when i wrote a wrong string of code. Let's see what's wrong and fix it asap. This crate model is much better than the past one, good job . 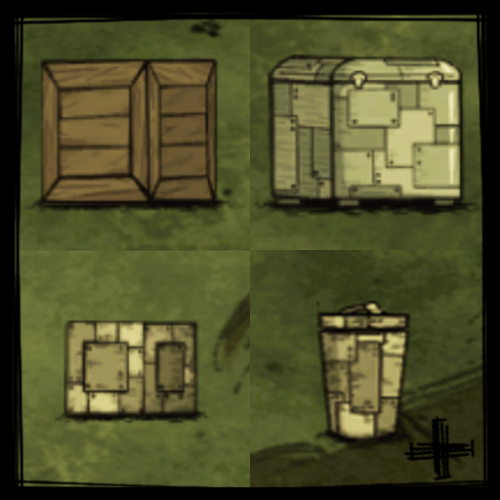 Now a question: i was using your old crate mod and i have 2 crates in my world: if i remove the old mod and use this, do i lose the crates that i already have? Here's the Willowson folder, here you can find the speech for when you light a fire because you are low on sanity (make sure NOT to delete or edit the willowfire file), here is the maximum sanity cap (i turned off the natural sanity regeneration), here's the fire immunity, and here and here's the igniting fires when insane. I'm gonna try to work on the last 2 points of your list (fire immunity and lower sanity) and see if there are some dialog strings that i can actually write for you. I am really bad in arts so i can't draw the portrait and, if you tell me wich special abilities to use, i can try to make them real. So the idea is to make a Wilson that has similar skills as Willow ones? Anyway, if help is needed with the mod, i can try to help you.